With May being Cancer Awareness Month, it is a good time to remind ourselves how easy it is to prevent one of the most common cancers, namely skin cancer. Most skin cancer is caused by the sun’s UV rays and over 2 million people are diagnosed with non-melanoma skin cancer every year. Knowing your ABCDEs of skin cancer, helps with self-examination of any moles or changes in your skin and thus acts as a catalyst to get screened by a healthcare professional. When checking your moles, the ABCDE rule is as follows: Asymmetry (one half of the mole doesn’t match the other), Border irregularity (poorly defined edges), Colour that is not uniform, Diameter that is greater than 6mm (about the size of a pencil eraser), and Evolving size, shape or colour. Redness, dark spots, raccoon-like eye circles and uneven skin colouring are all examples of what sun damage can look like on your face and body. Living in the South African sun, as we do, it is vital to be educated about the different ways sun damage can appear on your skin, so you can better protect yourself and know when to consult your health care physician. Tips such as avoiding the sun, particularly between 10am and 4pm, and always using sunscreen with UVA and UVB protection with SPF30 or more, are not merely lip service but should be followed strictly to prevent sun damage and, ultimately, any skin cancers. Reapplication of sunscreen is a must, together with sun hats, sunglasses and clothing made of tightly woven material with long sleeves. Naturally, it goes without saying that sun lamps, tanning beds or artificial lights are detrimental for your skin and put you at extreme skin cancer risk. Choosing the right skincare products, that contain UV protection, is another way to protect your skin. Luckily, Colorescience products show the brands full commitment to protecting the skin and preventing sun damage. 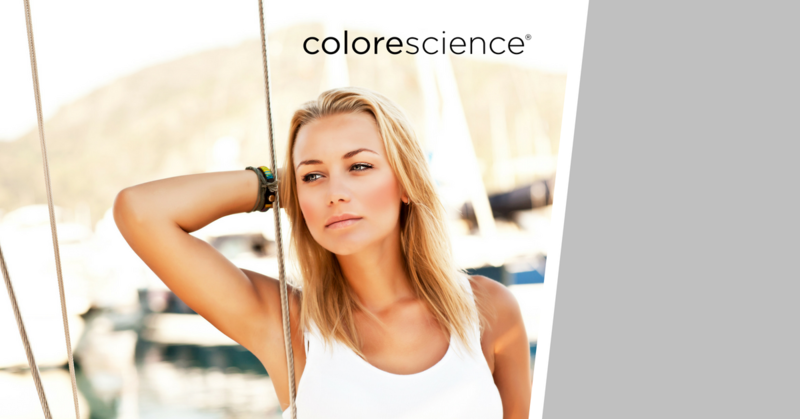 Colorescience offers the protection of a broad-spectrum SPF with the coverage of a treatment foundation. The brand’s mineral make-up comprises of naturally occurring inorganic materials that help in reflecting the sun’s UV radiation. One of its signature products, the Sunforgettable Brush-on Sunscreen is a mineral powder sunscreen in various skin tones that can be brushed on easily over the face and body. Because of this, it can be reapplied every two hours for maximum sun protection, and even reapplied over make-up. Similarly, the Sunforgettable range also includes a Total Protection Face Shield as well as a Brush-on Shield, both with SPF50 and both protecting the skin from harmful environmental aggressors such as sun and pollution. These are just a few of Colorescience’s UV protectors. It also ensures similar protection in his foundations, enhancers and other make-up products.